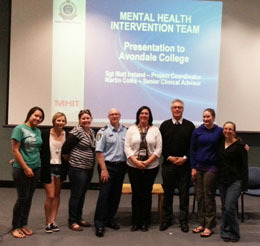 An Avondale lecturer was so keen to teach her nursing students about intersectoral collaboration she called the police. Lecturer Kerry Miller (centre) and her nursing students with Sergeant Matthew Ireland and Martin Collis from the NSW Police Force. Sergeant Matthew Ireland from the NSW Police Force’s Mental Health Intervention Team (MHIT) accepted an invitation from Kerry Miller to speak to second-year students about the responsibilities and the challenges of dealing with this vulnerable group of people. He explained how more than 16,000 members were receiving MHIT training. He also gave examples of how the police and the healthcare sector communicate to ensure appropriate assistance is received by those who need it. Clinical nurse consultant Martin Collis, seconded to MHIT from NSW Health, accompanied Matthew, sharing information about the nature of mental healthcare nursing and the role of nurses in intersectoral collaboration.